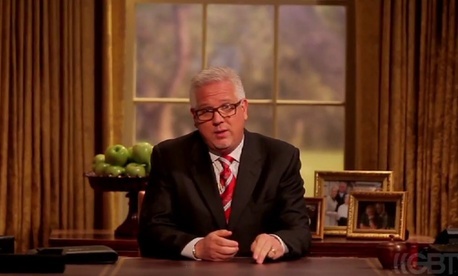 If you were wondering whatever happened to Glenn Beck, well here's your answer: He has resurfaced in a new video on "GBTV," in which he has apparently anointed himself president of the United States. In the video, Beck sits in an Oval Office set, delivering an address to the American people on fixing the country's ills -- which, to him, boil down to firing federal employees. When Washington comes to us selling their one product, which is more government, we have to have the intestinal fortitude to just say "No thanks." We're not interested. We're not buying any more. Simply doing that one thing will make so many things a lot easier. It will be easy to close federal departments and agencies and empty them out. It'll be easy to fire federal workers and see them apply those skills in the private sector. Things, we know, will work out for them -- after all, aren't we told time and time again that they are the best and the brightest?